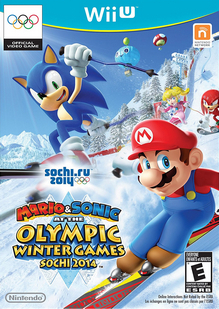 Mario & Sonic at the Sochi 2014 Olympic Winter Games for Nintendo Wii U was last confirmed available on July 8th, 2017. However, it is assumed the game was delisted on December 26th, 2017 alongside Mario & Sonic at the Rio 2016 Olympic Games which was announced ahead of its removal. Mario and Sonic go for the gold! Join your favorite characters, from Mario and Sonic to Princess Peach and Amy, as they team up and compete in the most exciting sports events at the Sochi 2014 Olympic Winter Games. Enjoy the thrill of 24 exciting events including bobsleigh, skiing, figure skating pairs, and even snowboard slopestyle, which will make its Olympic debut in Sochi, Russia. Feel closer to the action than ever before with the first entry in the Mario & Sonic series to utilize the Wii U™ GamePad and Wii Remote™ Plus controllers. In Biathlon, a cross country skiing/shooting hybrid, you’ll even use both as you switch controllers on-the-fly to earn the coveted Gold Medal. In addition, take on Snow Day Street Hockey, Rollercoaster Bobsleigh, and more supercharged Dream Events that combine familiar sports with outrageous settings, rulesets, and extreme action! And for the first time, head online** for global competition to help earn top scores for your home country! Let the games begin!